The Native Plant Society of New Mexico offers two beautiful native wildflower posters and one cactus poster. 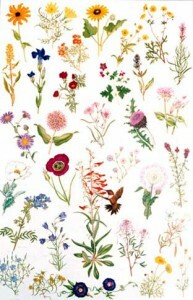 Wildflower poster is $8/poster for members ($10/poster for non-members). Cacti poster is $5/poster for members ($8/poster for non-members). Packaging and postage for 3 posters or less is $4.00. 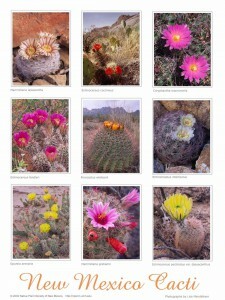 Ten or more posters: $5 each for wildflower and $4 each for Cacti (FOB Albuquerque). The beautiful wildflowers found along New Mexico’s roadsides are presented here in the hope that you will become familiar with their names, recognize them when you find them, come to care about them and help to preserve and protect them. New Mexico has an extraordinary variety of plants because it includes life zones from desert to tundra and because it takes in parts of five different floristic regions: the Rocky Mountains, the Great Plains, the Chihuahuan Desert, the Mogollon Plateau and the Great Basin. 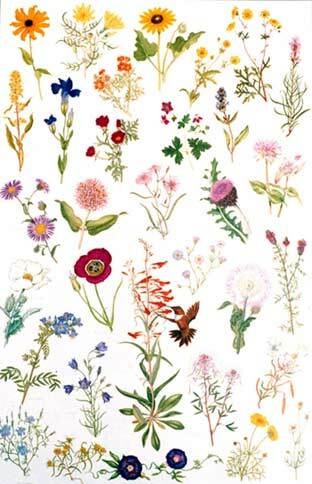 Few flowers are found in all parts of the state, but we have tried to show those easily found and which, taken together, represent the variety found in our state. Because we have chosen to present all the flowers in life-size, we could not include our state flower, the Yucca; its size would leave room for too few others and we felt that it is so well known that it did not need inclusion. It should be remembered when comparing flowers to the illustrations that flower and plant size can vary considerably depending on the conditions of the site where the plant grew and the amount of rainfall it received. The centerpiece of our summer and fall wildflower poster is a Rufous Hummingbird seeking nectar from a scarlet bugler Penstemon. This is a reminder that all plants and animals are interdependent and in protecting one, we help others to survive. 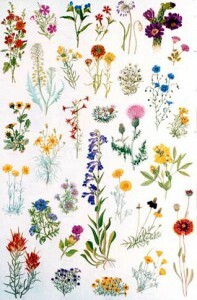 On this poster we show many flowers of the high mountain meadows as well as the lower parts of the state. We hope you will take the time to seek them out and enjoy their varied habitats. Some are large and showy and others are dainty and pale, but all together contribute to the unique beauty that is New Mexico. All are presented life-size, but size can vary greatly due to site and weather conditions. Compiled by Ellen Wilde with assistance from Society members. Copyright 1992. 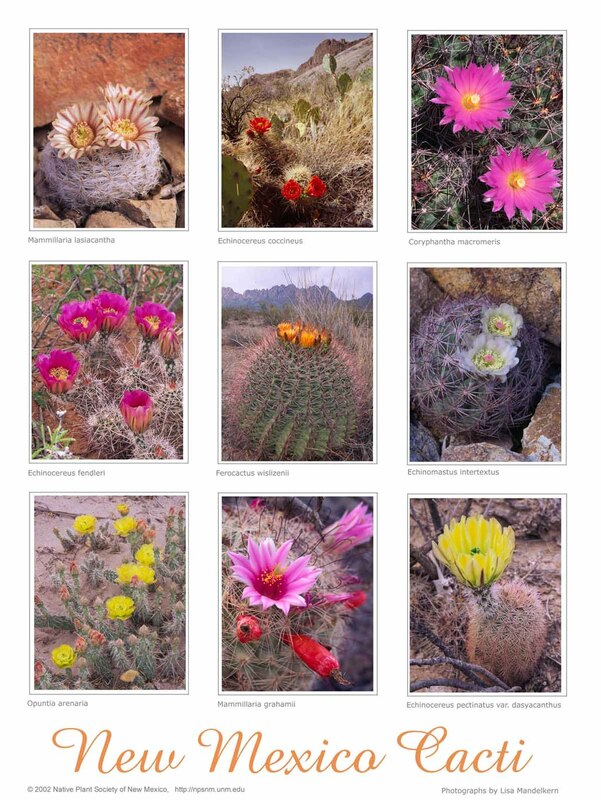 Plants are listed numerically according to the cacti poster image.